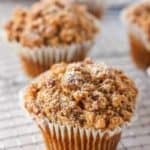 Pecan Crunch Muffins with double the crunchy topping! Make jumbo or regular size...either way they are a great way to get your Pumpkin Party started! Preheat oven to 375 degrees. Line a 12 cup muffin pan with 7 jumbo liners or 12 regular size liners. In a medium size bowl, combine flour, sugar, baking soda, salt and pumpkin pie spice.. In a larger bowl, combine pumpkin puree, milk, melted butter, eggs and vanilla. Add the pumpkin mixture to the flour mixture and combine gently and only until flour is fully incorporated. Over mixing will result in flat muffins. Divide batter into muffin liners. About 7 for jumbo liners - 12 for regular size. Combine flour,brown sugar, white sugar, nuts, pumpkin pie spice and salt. Add melted butter. Stir with a fork until crumbly. Add about a 1/4 cup of topping for jumbo muffins and several heaping tablespoons for regular size. You might have some topping left and thats okay! Bake for 25 minutes for jumbo and 20 minutes for regular size. Let cool and top with powdered sugar.